One of the ever-present threats of companies in the Food and Beverage business is food poisoning. This is especially so when you deal in seafood that spoils easily. Cut the Crab, a hip new restaurant chain with a great gimmick – eat the crabs served on the table without plates, forks or spoons – recently found out how difficult it is to deal with allegations of food poisoning, especially when these allegations are boosted by social media. The allegations, and their consequences especially when they are amplified by Twitter, provide an interesting study for students of crisis and issues management. So what are the salient learning from this incident (which has been summed up meticulously in Zeit Post – see below)? Hip restaurants attract hip, young diners who use social media extensively. If they have a complaint, whether justified or not, they will Twit first, think later. Companies that court such clients must have a response plan or a SOP to handle complaints, especially when the swarm starts to scale up these complaints. The chances of seafood spoiling at some point in time are very high, even when you take all the right precautions. So anyone dealing with seafood – and food generally – must prepare for the probability of complaints of stale, spoiled food or food poisoning. The restaurant should have a response plan not only to investigate the complaints and how to reach out to the victims – but also to demonstrate these actions to the media. The media, especially news portals with dedicated food writers such as detikfood and Okezonefood, will pick up whatever is hot on Twitter and run with it. Their coverage will in turn fuel a spate of Retweets and comments, in a Voracious Cycle around the issue. Controlling the situation means slowing the momentum of this cycle by engaging both the individual users and engaging the media proactively to demonstrate that you regret the incident, the reasons why it could have happened and what steps you are taking to remedy the situation – the Three Rs of crisis management. The Cut the Crab incident is still on the boil (ok, pun intended) at this posting. Will the franchise emerge out of this unscathed, as continued crowds at the restaurant even after the Twitter-news portal brouhaha broke out, seem to indicate; or will their business take a hit? Let’s watch the incident unfold. Mungkin akan terasa asing bagi anda mendengar nama restoran Cut the Crab. Tapi jika anda orang yang up to date dengan berbagai macam restoran seru di Jakarta. 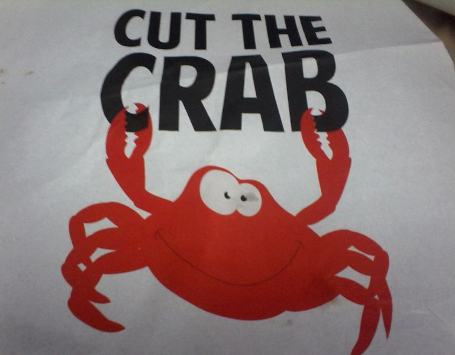 Cut the Crab adalah salah satu restoran seafood yang fenomenal. Tentunya anda tidak makan kepiting layaknya di restoran all you can eat. Bebas yang di maksud adalah anda bisa makan dengan tangan dan bergaya seperti di rumah. Penyajian nya juga unik, pesanan anda akan datang di dalam kantong plastik bening dan di tuang begitu saja di meja makan. Tentunya meja sudah di sterilkan terlebih dahulu sebelumnya! Wow seru sekali bukan? Tentunya dengan penyajian yang unik ini, banyak orang yang penasaran dan kembali lagi untuk pengalaman lain menyantap makanan seafood. Restoran ini mengusung kepiting sebagai salah satu menu spesialisasi. Restoran ini juga ramai dan selalu penuh pengunjung pada akhir pekan. Baru kali ini terjadi pemberitaan yang mencuat di media semenjak di bukanya restoran ini pada Mei 2013. (Belum di ketahui apakah ini restoran di CTC Cikajang atau cabang lain). Tentu tidak ada restoran yang ingin mencelakakan pelanggan, apalagi menyediakan sajian yang tidak segar dan berpontensi mengandung racun.